Dieses Buch über Jugend- oder vielleicht eher: Jungenliteratur ist immer noch eine Folge meiner Kipling-Entdeckung im letzten Jahr. Die Erstausgabe ist von 1948, die überarbeitete Version von 1975, und es sah mir so altväterlich-uninteressant aus, dass ich lange gebraucht habe, bis ich es gelesen habe. Es war dann aber doch eine schöne Entdeckung. Das letzte Kapitel über Literatur nach dem Zweiten Weltkrieg ist tatsächlich wenig ergiebig, aber der Rest um so mehr – das sieht man an den vielen Zettelchen, die ich ins Buch geklebt habe. Turner beginnt mit dem Kapitel „Gothic Hangover“ und der Schauerliteratur des 19. Jahrhunderts, einer Art Schwundstufe oder Trivialisierung der gothic novel des Jahrhunderts zuvor. Veröffentlicht wurden diese Fortsetzungsgeschichten als penny dreadfuls, auf billigem Papier schlecht gedruckt, mit dramatischen Geschichten um edle Räuber und blutdurstige Vampire. How the waggish young lawyers‘ clerks laughed as they smacked their lips, and sucked in the golopshious gravy of the pies, which, by the by, appeared to be all delicious veal this time, and Mrs Lovett worked the handle of the machine all the more vigorously, that she was a little angry with the officious stranger. What an unusual trouble it seemed to be to wind up those forthcoming hundred pies! How she toiled, and how the people waited; but at length there came up the savoury steam, and then the tops of the pies were visible. 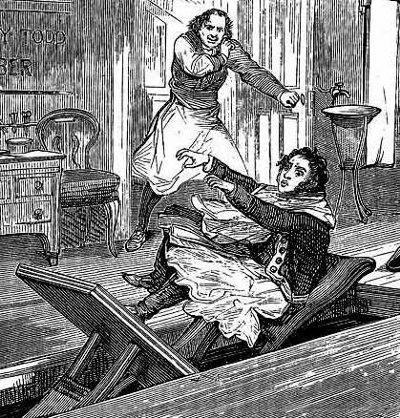 They came up upon a large tray, about six feet square, and the moment Mrs Lovett ceased turning the handle, and let a catch fall that prevented the platform receding again, to the astonishment and terror of everyone, away flew all the pies, tray and all, across the counter, and a man, who was lying crouched down in an exceedingly flat state under the tray, sprang to his feet. Mrs Lovett shrieked, as well she might, and then she stood trembling, and looking as pale as death itself. It was the doomed cook from the cellars, who had adopted this mode of escape. The throngs of persons in the shop looked petrified, and after Mrs Lovett’s shriek, there was an awful stillness for about a minute, and then the young man who officiated as cook spoke. With a sudden rush that could not be foreseen – with a strange howling cry that was enough to awaken terror in every breast, the figure seized the long tresses of her hair, and twining them round his bony hands he held her to the bed. Then she screamed – Heaven granted her then power to scream. Shriek followed shriek in rapid succession. The bed-clothes fell in a heap by the side of the bed – she was dragged by her long silken hair completely on to it again. Her beautifully rounded limbs quivered with the agony of her soul. The glassy, horrible eyes of the figure ran over that angelic form with a hideous satisfaction – horrible profanation. He drags her head to the bed’s edge. He forces it back by the long hair still entwined in his grasp. With a plunge he seizes her neck in his fang-like teeth – a gush of blood, and a hideous sucking noise follows. 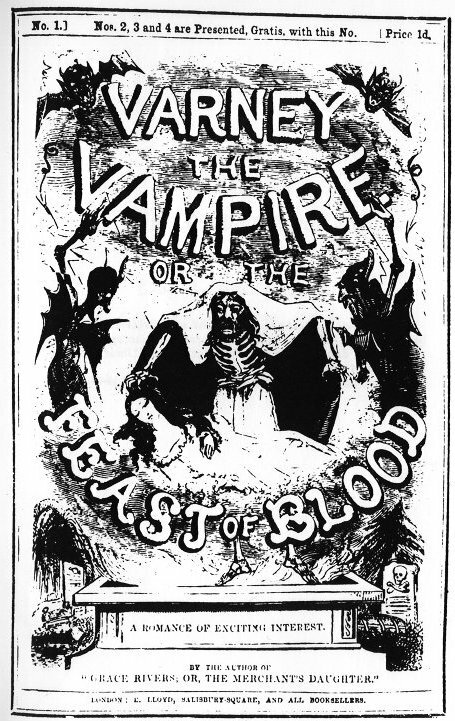 The girl has swooned, and the vampyre is at his hideous repast! Gar nicht mal unspannend, aber natürlich zu lang zum Lesen. Am Schluss stürzt sich Varney in den Vesuv. — Spannend klingen auch die Zitate aus der Piratengeschichte The Skeleton Crew, or Wildfire Ned oder The Wild Boys of London: „In the doorway, in her nightdress, which revealed all the beauties of her buxom form, stood Mary Kelly, a pistol in each hand.“ Was will man mehr? Andere Piratengeschichten lesen sich wie Pirates of the Carribean, voller Hexen, Monster und Magie. — Interessant auch die Figur des Spring-Heeled Jack, der ich zum ersten Mal in einer Stephen-King-Kurzgeschichte begegnet bin. (In seiner Sammlung Night Shift, sehr lesbar.) In den penny dreadfuls war das eine Art Superheld-Vorläufer: blutrotes Trikot, Fledermausflügel, Haare vom Löwen und Teufelshörner und Schwefeldunst aus dem Mund, sprang er in riesigen Sätzen durch die Landschaft und half Witwen und Waisen – alles nur eine Verkleidung natürlich, seine übernatürlich Sprungfähigkeit basierte auf einer Konstruktion aus Metallstäben und Sprungfedern. Turner erzählt das alles mit zurückhaltendem, aber immer wieder durchscheinendem Enthusiasmus, feinem Gespür für Ironie und viel Hintergrundwissen. Die Auszüge aus Leserbriefen und Geschichten machen enorm Lust, die Hefte zu lesen. — Gar nicht bekannt war mir das Invasions-Subgenre, etwa Britain Invaded (ab 1912): die Preußen stehen in London. St. Paul’s und Big Ben sind zerstört, nur südlich der Themse gibt es noch Widerstand. — Dann gibt es auch Unmengen von Detektivgeschichten und Serienhelden. Einer von ihnen, Martin Track aus dem Magazin Dreadnought, war eine Kuriosität: lebt in einer exotischen Burg an der Nordsee, von Wachpersonal und einem chinesischen Zwerg geschützt. Besuchern werden die Augen verbunden, Löwen und Tiger wandern umher, Angriffe von Piraten und Gangsterbanden sind an der Tagesordnung. Das würde ich gerne mal lesen, da sieht ja Doc Savage harmlos dagegen aus. There is no class of vulgar publications about which there is, to my mind, more utterly ridiculous exaggeration and misconception than the current boys‘ literature of the lowest stratum. This class of composition has presumably always existed, and must exist. It has no more claim to be good literature than the daily conversation of its readers to be fine oratory, or the lodging-houses and tenements they inhabit to be sublime architecture. But people must have conversation, they must have houses, and they must have stories. The simple need for some kind of ideal world in which fictitious persons play an unhampered part is infinitely deeper and older than the rules of good art, and much more important. It is the custom, particularly among magistrates, to attribute half the crimes of the Metropolis to cheap novelettes. If some grimy urchin runs away with an apple, the magistrate shrewdly points out that the child’s knowledge that apples appease hunger is traceable to some curious literary researches. 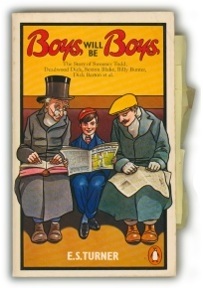 The boys themselves, when penitent, frequently accuse the novelettes with great bitterness, which is only to be expected from young people possessed of no little native humour. If I had forged a will, and could obtain sympathy by tracing the incident to the influence of Mr. George Moore’s novels, I should find the greatest entertainment in the diversion. In this matter, as in all such matters, we lose our bearings entirely by speaking of the ‚lower classes‘ when we mean humanity minus ourselves. This trivial romantic literature is not especially plebeian: it is simply human. […] . Ordinary men will always be sentimentalists: for a sentimentalist is simply a man who has feelings and does not trouble to invent a new way of expressing them. These common and current publications have nothing essentially evil about them. They express the sanguine and heroic truisms on which civilization is built; for it is clear that unless civilization is built on truisms, it is not built at all. Clearly, there could be no safety for a society in which the remark by the Chief Justice that murder was wrong was regarded as an original and dazzling epigram.